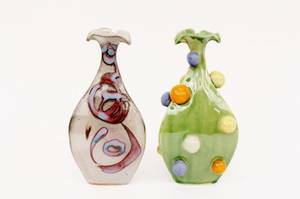 Three stoneware vases made by Asheville, North Carolina contemporary artists Sandy and Margaret Ann Batton. 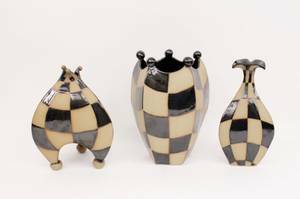 Each vase decorated with large black check pattern against unfinished clay surface. Marked on bottom. Largest measures 10" high x 6" wide.